As disruptive innovations cross the chasm and prepare for widespread adoption, early adopters need to integrate them with the levers of market power to create unusual value. For over 20 years, I have helped companies seize unusual advantage by adopting disruption ahead of competitors, so here I’ll share how early adopters are creating value with social network investments. Specifically, I will show how to combine social networking with “business development” (practice development, sales). I will begin with a high-level description of the social network-led business development life cycle, and I’ll close with key thoughts on value and ROI. 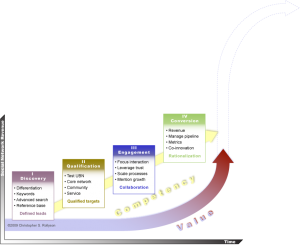 Although the immediate context here is B2B and business development, the principles also apply to the B2C environment. The B2B (business to business, commercial) world is often characterized by large or strategic transactions with long sales cycles. One begets the other. The business relationships that drive these transactions require a concomitant level of trust. Therefore, for the B2B executive, the question becomes, “How can we use social networks to reduce the sales cycle?” And, “How can we conduct ourselves in social networks so that we increase trust efficiently?” However, most executives do not think like this when they consider investing time and money in social networking. They ask, “What’s the ROI?” Their teams do not understand how to interact in the social network environment to increase trust and reduce the sales cycle. The stakes are high. The firms that use social networks to reduce their sales cycle Discovery process by (roughly) 30% will have a significant competitive advantage. I predict similar benefits after Discovery in the busdev cycle. This revolution in communication is similar in scope to Ford’s invention of the assembly line for fabrication. This article will provide a basic framework [click graphic to enlarge]. As I wrote in How Social Networks Change the Rules of Business Development and Profit, social networks significantly change the numbers of profitability because they enable companies to find people or firms that map closely to their USPs (unique selling proposition). To succeed, firms need to define prospects explicitly and determine keywords that are associated with prospects. This is not a trivial exercise, but it can be approached in iterations to minimize upfront costs. Firms need to define their USPs and be honest: how many clients map closely to the USP? (answer: not many). How long does it take to find and develop a prospect with a unique buying need (UBN) that corresponds? When searching for prospects to “put into the funnel,” insist on those with a long list of characteristics. Social networks make them easier to find. Beginning state: few USP-appropriate prospects. Social network action: Use social networks to test and define your differentiation and USP. Find targets with very specific needs, interests and in certain types of situations that map to your USP. They want to manage risk or capitalize on opportunity. Ask your network for help, participate in prospect- and keyword-specific discussions and activities. Contribute links and thoughts; connect people. Draw attention by serving people associated with prospects. Your contributions inspire people. Because you participate in open forums, you are serving the person who has asked for help and all the people observing the interaction. Very efficient. Experience & skills: 1) understanding USP, symptoms and situations; 2) translating these into keywords; 3) finding the right venue; 4) using advanced search tools; 5) build reference base of thought leadership. End state: 1) USP-appropriate prospects 2) repeatable processes. Measurement: Using legacy processes (i.e. conferences, golf outings, club meetings), how long does it take to identify a certain number of key prospects? How much does it cost in money and time? This is your baseline. Compare the baseline with how long it takes to use LinkedIn, Facebook Twitter, YouTube and others to identify specific people that map to your USP. Beginning state: identified targets, little trust. Now you have specific prospects identified and located, but they are hypotheses that require further qualification. You need to test your insight about their UBN. Legacy processes would call for phone or email communication to ask for meetings. This takes weeks or months. In these meetings, you share researched information about prospects’ situations and ask questions. Your counterparts have questions for you. You define next steps. This is a painful process for all parties; it is very costly and time-consuming. Slow. Social network action: Social networks like LinkedIn, Facebook and Twitter can enable you to cut this qualification cost significantly. Find information about the company and which stakeholders are having the types of problems you solve. Ask your friends; traipse through Facebook Walls, LinkedIn Answers and Twitter feeds, looking for patterns of keywords, interaction and people. Then you need a specific, sincere proposition for the people you find. You also need information about your firm and yourself that the other person can see in one click (LinkedIn Profile with Recommendations, contributions to Facebook Walls and Groups, tweets). In LinkedIn, you tell them what your interest is and suggest a call or blog post you believe to be relevant to their situation. In this scenario, you can exchange high quality information before you get the meeting—and at a far lower cost to you and the other person. It’s scalable; continue to build out your reference base (thought leadership); you are writing blog posts and recording videos that relate to the USP, and each is a tool that you can invoke in one click. Using these techniques, you can work a far larger pipeline. In Phase II, you build your core network and morph it into a fledgling community that you serve. Recall your high school physics: community service is like giving kinetic energy to people, which builds potential energy within the community around you. Serve by helping people who are either trustworthy or who have interests that complement yours. Your interactions with them will enable you to qualify them further. In addition, because you can find people efficiently, you waste far less time with sub-par prospects. Look to eliminate prospects as quickly as possible. This aligns you with prospects, who hate salespeople wasting their time. On the social network or blog, ask about the business situation, suggest a call when you’ve traded some information and you want to “go private.” Share (blog) posts you’ve written or responded to that address the issue. Ask friends to give you specific insights. Share articles. Like meetings, each interaction you have in which you offer value and follow through increases trust. This is an end in itself. Remember that many of these interactions are taking place in public forums, so your conduct is observed by many people, even though your team will not appreciate this, and there may be little sign of “return” at first. Experience & skills: 1) creating short, sincere, specific propositions for people you want to engage; 2) leveraging connections/friends to make introductions; 3) using advanced search within platforms as well as Google to drill down efficiently; 4) writing/recording (video, audio) relevant content that shows your expertise; 5) contributing on Walls, Answers, Twitter content so that you add to the conversation but avoid being self-serving; 6) creating a process for working your social network pipeline (tip: it’s far more diverse and complex than anything you’ve done before ;~); 7) community service means giving without expecting a return: don’t fool yourself, people know the difference. End state: 1) qualified prospects 2) qualification process 3) numerous dialogs with people that continue beyond the “employment situation” of you or the prospect. When you’re connected on LinkedIn, friended on Facebook and followed on Twitter, the relationship survives the work situations of each party. Measurement: How many relevant threads you maintain with people who matter. LinkedIn, Facebook and Twitter all enable you to keep sharing with your connections. You also let people observe you interacting with other people, which can increase trust fast. How many of your connections volunteer to share relevant things with you. How many people respond–and how quickly–to your requests for help. Beginning state: many “loose tie” interactions with relevant prospects that map to your USP. Based on circumstance and increasing engagement, any of these can promote to “Engagement,” in which you actively explore working together. That’s the goal of this stage. Each one of these touches is an opportunity to increase trust. Remember, you are actively increasing trust with the person with whom you are interacting, but you are also passively increasing trust around you because you are being observed. This difficult to measure, but it’s very powerful. Trust plus situation equals engagement. Obviously, this has always been true; only now, it’s big, bad and digital (trackable). Order of magnitude more efficient. Experience & skills: 1) identify/communicate solid value proposition in relevant way, motivating prospects to suggest or respond to the suggestion to work together; 2) ask for help and show gratitude; 3) scale your community management processes (Facebook walls, Twitter feeds, LinkedIn Groups and Answers) and drive this knowledge among your team (within and without the enterprise); 4) use your processes to manage your growing network; 5) communicate crisply and help people to understand your focus; tell people at every turn what situations you’re looking for and what’s not interesting to you. End state: 1) Increasing numbers of people approach you; 2) you approach people successfully, often through quality referrals; 3) situations develop in which you initiate or are invited into private collaborations to scope out deals. Measurement: The quality of information and intimacy that people are sharing is a good measure of trust. How many referrals you receive from your network. The depth of conversations you are having. People come to you for advice. How many spontaneous mentions you receive in blogs, social networks and other venues you care about. Number of retweets. Beginning state: growing slate of highly qualified prospects, increasing level of trust, numerous active conversations to explore work structures and financial arrangements. Managing engagements while growing the business. Social network action: in Stage IV, the scope of use of social networks widens to supporting client relationships; although you are in the proposal, winning and management stage now, you are reaching out to your network for help and insights into the challenges your prospect/client faces as well as how to sell the work; this stage most closely resembles “legacy” dealmaking and business development. Depending on the work, you may well be supporting the client through your social networking activities (supporting client initiatives with social networks). Increasingly, you will probably apply your prowess with social networks and business development to your clients’ businesses, increasing your relevance and value add. Experience & skills: 1) structuring work to make impact and be practical; 2) helping the prospect navigate politics/group dynamics; 3) performing the work or delivering the product in order to increase value and trust; 4) asking the prospect/client to go public with the results of the work; 5) contributing your knowledge of social networks to the engagement; 6) using social networks to knit your team of employees/collaborators to manage the pipeline and book of business more efficiently; 7) advising the client on applying social networking to their business. During the next 3-5 years, demand will skyrocket for knowledge of how to apply social networking to legacy businesses; even though you may not be an expert, clients will often draft you; if you have gone through this cycle, you will be more knowledgeable than many of your clients. However, the demand for social networking fundamentals will be short-lived as knowledge will spread quickly. End state: 1) defined and predictable quantitative metrics for your pipeline; 2) need to scale the activity to various parts of the business; 3) rationalize client portfolio, replacing “Dispose” clients with “Grow” clients; 4) higher profitability; 5) client-led open innovation activity. 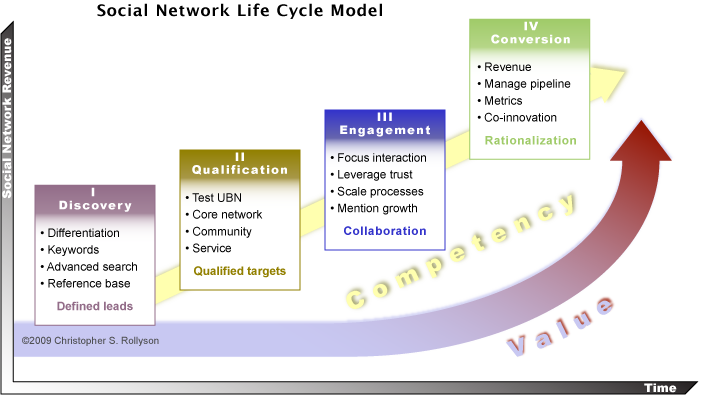 I use a more specific version of this model in client work, and teams invariably ask, “This is new? We’ve been doing this forever!” This is precisely the point: social networks scale the digitization of certain aspects of human behavior, how people develop and grow relationships and make decisions. One part of it is familiar: develop knowledge about the prospect’s situation, conduct oneself in such a way as to create trust, and manage the business while growing it. The other part is not familiar: how to do this digitally in largely public places, how to practice transparency, how to use rapidly morphing tools for high-value/risk situations. What is different is that we can use social networks for many of the interactions (“transactions”) that are required to increase knowledge and trust, increasing speed and decreasing cost. The increase in productivity will be akin to Ford’s assembly line. Digital transactions are usually lower cost than analog. I am by no means advocating the elimination of analog; a key part of relationship development is getting across the table; however, we use social networks to discover and pre-qualify prospects much more quickly and cheaply. Having helped executives profit from disruption since the 1980s, I perceive that Web 2.0, since it will transform relationships, will be far more disruptive than the Internet. As this graphic shows [click to enlarge], this Social Network Life Cycle Model is part of a larger S-curve, which tells us that significant revenue will be generated by companies and people who understand how to build and leverage Web 2.0 ecosystems around themselves. In 5-10 years, however, this will become table stakes, as did the Internet, we we pass the top curve of the S and Social Network Revenue will level off. “Return on Investment” (“ROI”) is a broad concept that attempts to measure the value to the investor. It is a widespread tool to understand risk (investment) and reward (return). It is overused and, in the case of Web 2.0, misapplied so that it distorts thinking around how to adopt Web 2.0. Social networks represent a facsimile of analog interaction; as such, they seem strange because they mirror what we do off-line, but not exactly. They require us to be more aware of what we are doing because they are facsimiles; we are “recreating” something. B2B has always been about relationship, so social networks used in the B2B context require a relevant life cycle. In the first three stages, IOR, “Invest on Relationship,” is appropriate. 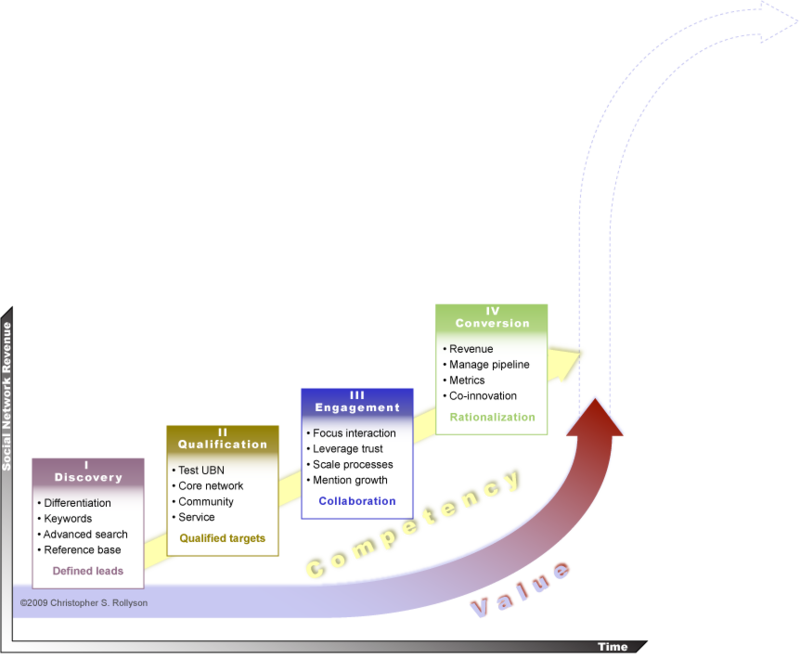 Note in the graphic that the slope of the Competency Curve is constant: in the first three stages, firms are (largely) focused on skill development without a requisite increase in revenue (they see relationship benefits before revenue). 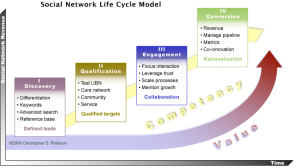 In Stage IV, however, the Revenue Curve crosses the Competency Curve. ROI is premature for the market overall because even early adopters are still muddling through the first three stages. When the market has standardized processes and data/results follow, we will be able to calculate ROI quite easily. In the meantime, I hope that the Social Network Life Cycle Model (SNLCM) provides you with a framework that helps you create standard processes, so you can invest more aggressively and enjoy consistent results. What Web 1.0 (the Internet) did to retail, Web 2.0 will do to “business development” (and pretty much every other process ,~). Learn this earlier rather than later. Applying social networking to your business processes requires significant culture change, so wise executives will get started as early as possible. Significant additional information and tools are available at the Social Network Roadmap, a methodology I use when serving clients.